17. August 2017 Rike OehlerkingVisit BremenHandel, Hanse, Marktplatz, Mittelalter, rathaus, Roland, Schütting, Stadtwaage, Wirtschaft..
Hanseatic is a word that you will come across wherever you go in Bremen. Centuries ago, the city was part of one of the world’s most powerful trade alliances, whose members joined forces to make trading routes safer and pursue shared commercial interests. But what remains of this Hanseatic League? 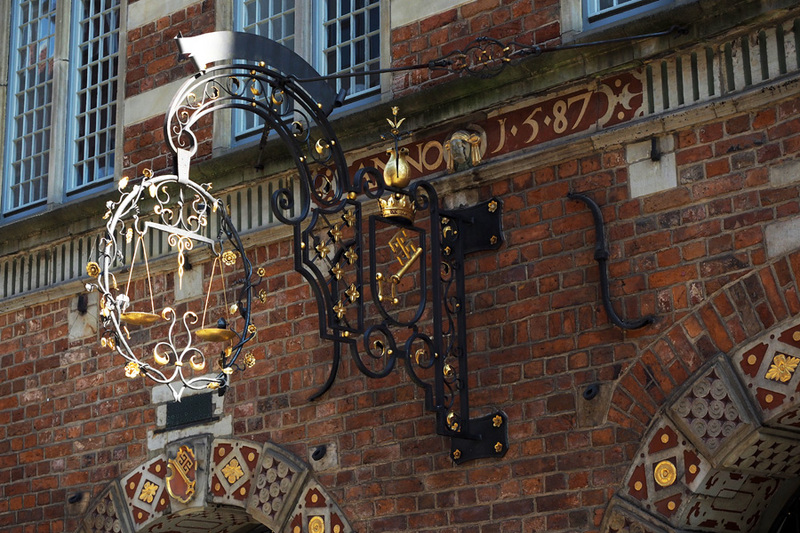 What remnants of this chapter of history can still be found in Bremen today? I embarked on a mission to find out more. Before venturing out into the city for some real-life research, I decided to go on a virtual journey back in time to explore the history of the Hanseatic League, which existed from the 12th until the 17th century and – in its prime – counted up to 300 seaports and inland cities in northern Europe among its members. It turns out that Bremen always had a special relationship with the Hanseatic League. The city first joined the powerful trade alliance in 1260. Over the following centuries, it was expelled three times by the other members but eventually rejoined every time, until the alliance finally ceased to exist in 1669. Bremen already had its own powerful trading network before the Hanseatic League was founded, and maintained this throughout its membership. Many merchants in Bremen therefore didn’t consider membership necessary or useful. So it didn’t take long for quarrels to arise when the city joined up in 1260. One major complaint was that Bremen was thought to be too lax in its efforts to combat piracy. In fact, many merchants along the Weser river used the anti-piracy measures of the Hanseatic League to their advantage and secretly made their own pacts. This dispute got the city expelled for the first but not for the last time, and every expulsion was the result of provocations, differences of opinion and violations of rules. It was alleged that the merchants of Bremen were benefiting from the advantages of the league without fulfilling their obligations. The historic facts around these fickle relations are too complex to allow a neat summary for the purposes of this article, but my research (e.g. on this website) clearly showed that freedom has always been of great importance to Bremen. 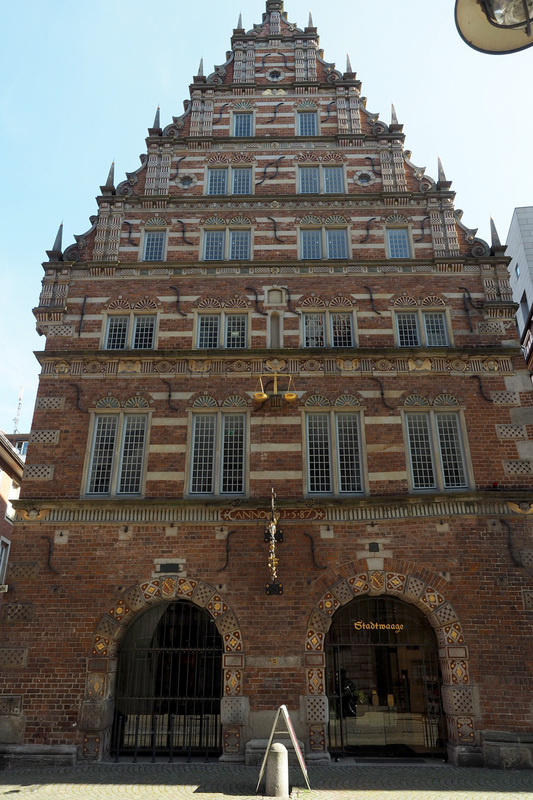 Another piece of information that I came across during my research is that brick Gothic architecture is a distinguishing feature of cities that used to be part of the Hanseatic League. Picturing places such as Lübeck, Wismar, Rostock and Stralsund, I can clearly see similarities in the style of their prominent buildings. Lots of brick, lots of narrow houses with tall gables, and some beautifully decorated facades – all features that can equally be found in the centre of Bremen. 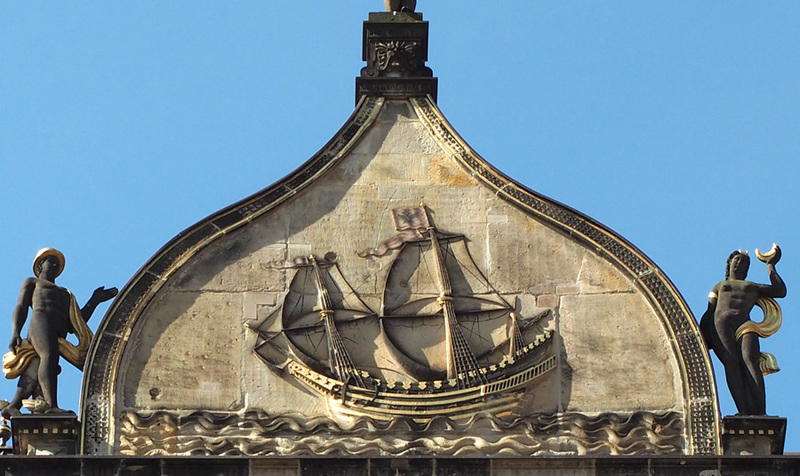 Aside from the architectural styles, another Hanseatic hallmark is the cog, a type of manoeuvrable trading vessel that adorns the coat of arms of the Hanseatic League. The colours red and white are also a common reference to Hanseatic heritage and still feature in the coat of arms of many former member cities. For Bremen, trade and travel by sea have always been of crucial importance. I am cycling towards the centre of Bremen, heading for the market square. It is 10.30am on a Monday morning and the sky is a glorious blue. The Roland statue is surrounded by a bustle of tourists, youth groups and locals. First, my eyes scan the ornate facade of the town hall, but I can’t see any obvious signs that allude to the Hanseatic League. However, I do spot figures with anchors and other nautical symbols. 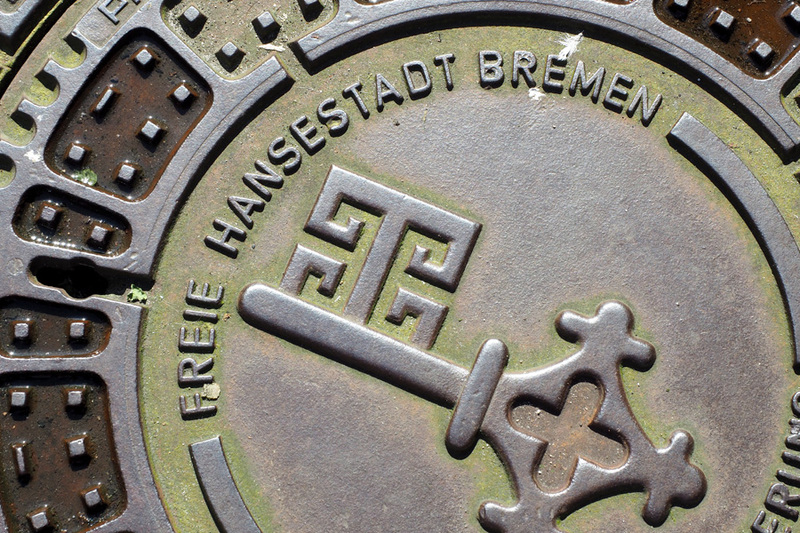 Anchors and other symbols reflect the importance of water and the sea for Bremen. The old town hall was completed in 1409. At this time, Bremen had just rejoined the Hanseatic League after its first expulsion. 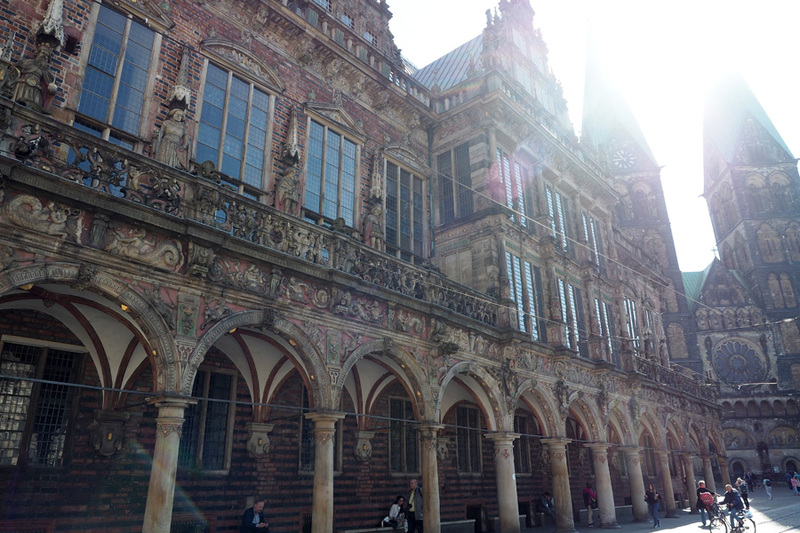 In the 15th century, this prestigious building was used to host meetings of representatives of the League members, which took place at regular intervals (twice in the town hall of Bremen). 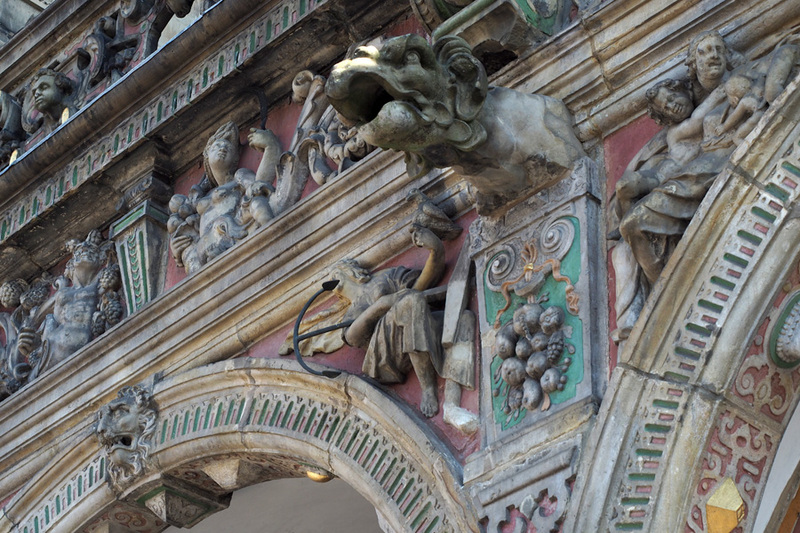 However, the richly detailed facade, which is full of symbolic references to the independence of the people of Bremen and the freedom of the city, was only added to the building in the early 17th century. The magnificent facade of the town hall was also intended to reflect the power and wealth of the city. 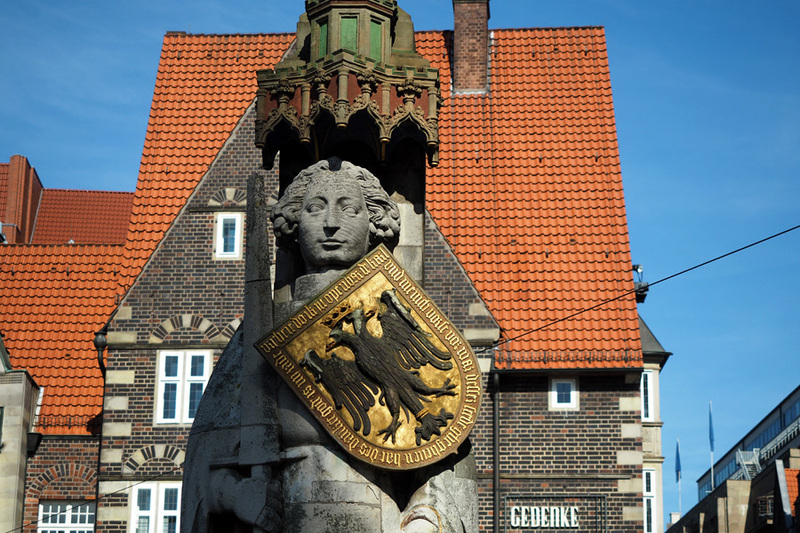 The Roland statue, which was rebuilt in the market square in stone in 1405 after the previous, wooden statue had burned down, embodies similar values. As a symbolic ‚envoy‘ of the emperor, the Roland statue represents the city’s market rights and the freedom of its citizens. Opposite the Roland statue and town hall you will find a building called the Schütting. 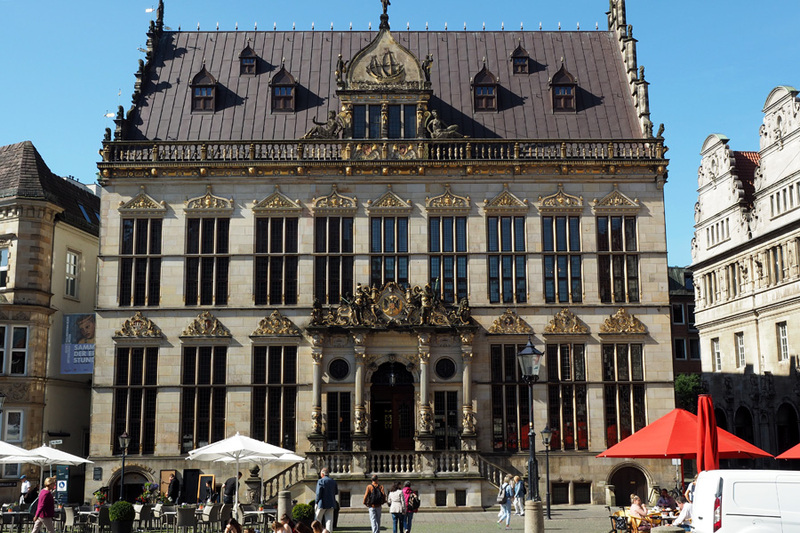 In order to manifest the presence and power of the merchants, the Elterleute (the leaders of the merchants of Bremen), bought a guildhall on the market square in the 15th century. After a few decades, the building was demolished and a bigger, more impressive building was constructed. The Schütting – the heart of Bremen’s trading power, long before the chamber of commerce moved in. While the foundations of the Schütting as a hub for trade and business endured, the exterior underwent countless changes and additions over the centuries. Today, the building is home to the Bremen Chamber of Commerce. 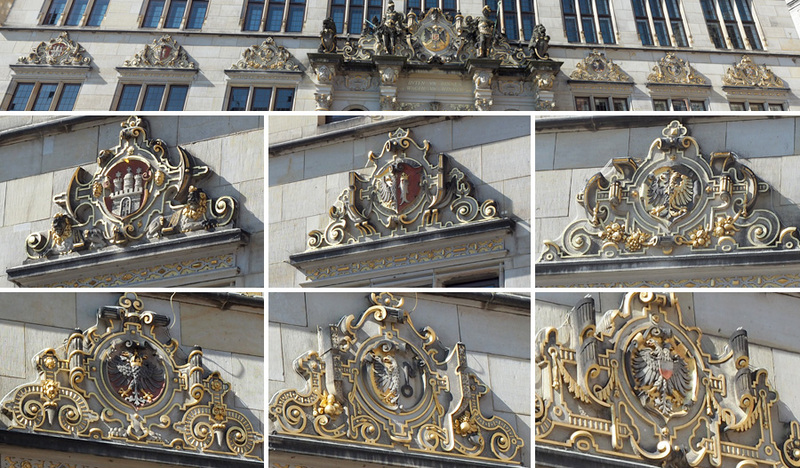 Unlike the town hall, the front of the Schütting is full of signs of Bremen’s membership(s) in the Hanseatic League. A statue of Neptune, the god of the sea and patron of seafarers, stands tall on top of the main gable. Below it, a sailing ship is carved into the face of the gable. The importance of sea travel for trading in Bremen is clearly emphasised. But there is even stronger evidence of Bremen’s Hanseatic past. Further below, just above the main portal, I can spot the coat of arms of the Schütting, which features the imperial double-headed eagle wearing the key of Bremen’s coat of arms on its breastplate. At the same level, but further left and right above the windows, I can see slightly smaller coats of arms of six other cities and foreign trading posts of Hanseatic merchants: Hamburg, Bergen, Bruges, London, Novgorod and Lübeck. All of these cities were members of the Hanseatic League. Bremen’s key allies and trading partners all lined up: Hamburg (top left), Bergen, Bruges, London, Novgorod and Lübeck (bottom right). As I walk across the market square, something else catches my eyes that I had never noticed before. 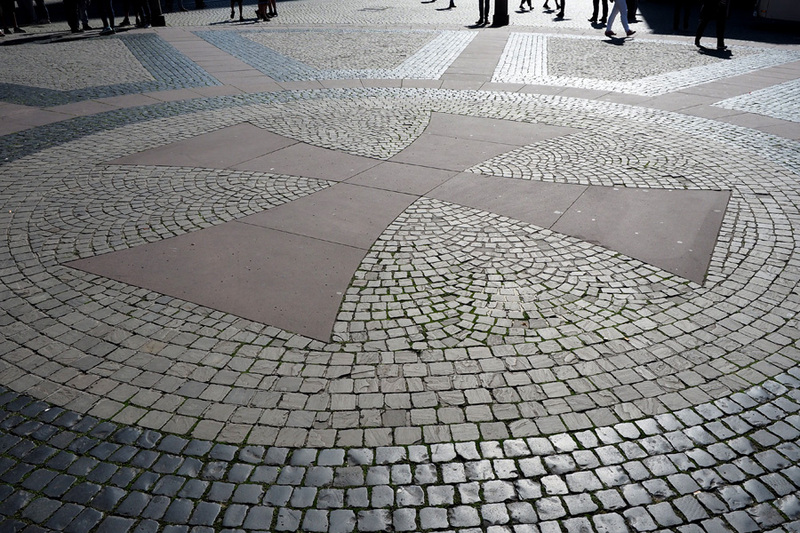 At the centre of the square, coloured flagstones form a big cross of about five by five meters – the Hanseatic Cross. This symbol originates from a time long after the collapse of the trade alliance, when citizens of Hamburg, Lübeck and Bremen formed the Hanseatic Legion to fight in the War of the Sixth Coalition, which brought about Napoleon Bonaparte’s fall from power in the early 19th century. So once again, Bremen was part of a historic fight for freedom. 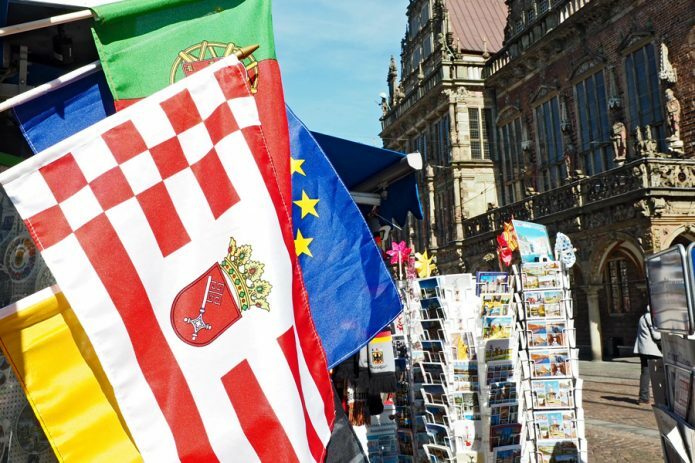 The Hanseatic Cross on the market square does not relate directly to the Hanseatic League, but is yet another symbol of freedom and solidarity. Finally, I leave the market square behind and venture along Langenstrasse in a south-westerly direction. After only a few yards, I stop in front of a building on my right that I vaguely associate with the Hanseatic League: the Stadtwaage (city weigh house). Like many of the buildings I mentioned previously, the weigh house in its current form dates back to around 1600. And, as the name suggests, it used to be a public place where goods could be weighed, which helped to prevent fraud and determine the amount of tax to be paid. Institutions like this may not have necessarily been introduced directly by the Hanseatic League, but I can see a clear connection with efforts around this time to standardise measurement units and protect merchants. In the Middle Ages, merchants came to the Stadtwaage to weigh their goods. Having a public place to weigh goods helped to protect merchants against fraud and facilitated the collection of tax. The last leg of my Hanseatic city tour takes me across Martinistrasse and towards the Weser river. I stroll along the embankment until I reach the underpass that leads to the Schnoor quarter. I’m sure that the medieval merchants would have come here, to the oldest part of Bremen, to negotiate their trades and complete parts of their six-year training to become a travelling merchant of the Hanseatic League. Some of the deals they made might have gone far beyond economic interests, shaping the structures of political power. And maybe there would have even been some pirates lurking in the shadows. At least that’s how I’m imagining it. Most likely, the reality at the time had little in common with the picture-book scenes that we paint in our heads. But this period played an important part in making Bremen what it is today – a Free Hanseatic City. Bremen’s key – a symbol of freedom?